Has your family done anything fun lately? Why not not come to Montgomery and experience fun the family way? 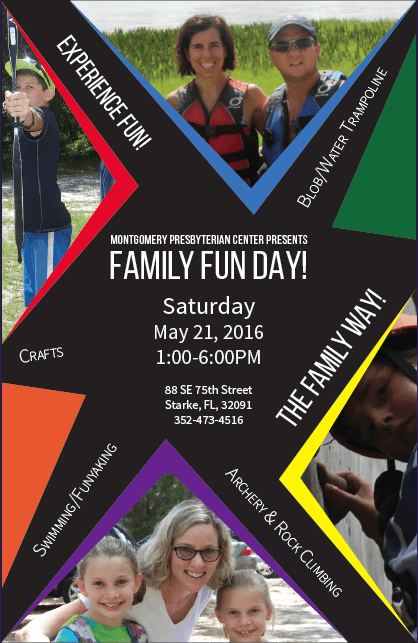 Montgomery is hosting Family Fun Day May 21st from 1pm-6pm. Come blob, rock climb, shoot archery, swim, tour the facility, make crafts, meet this years summer staff or just set up a hammock and relax in creation. BBQ hot dogs, hamburgers and all the fixings will also be provided. There’s no charge for the blessings we receive, so we won’t charge you either!